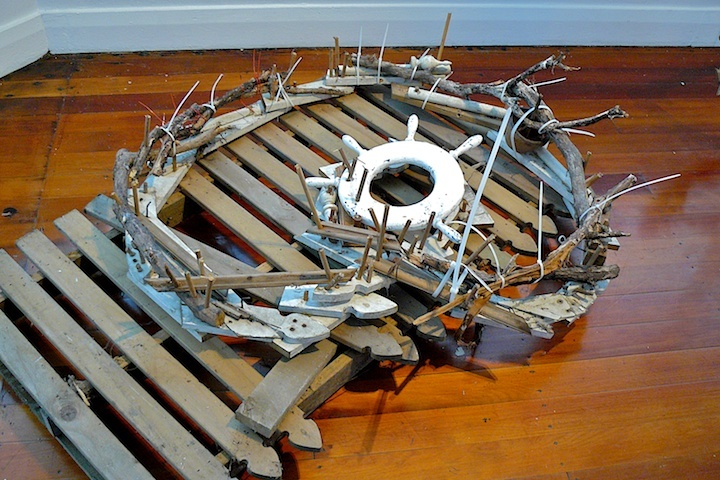 The current exhibition “Wood for the Trees” at Lopdell House in Titirangi brings together works by five artists: John Lyall, Michael Shephard, Russell Moses, Tanya Ruka, Derek March. Many environmental and historical ideas are touched upon throughout. 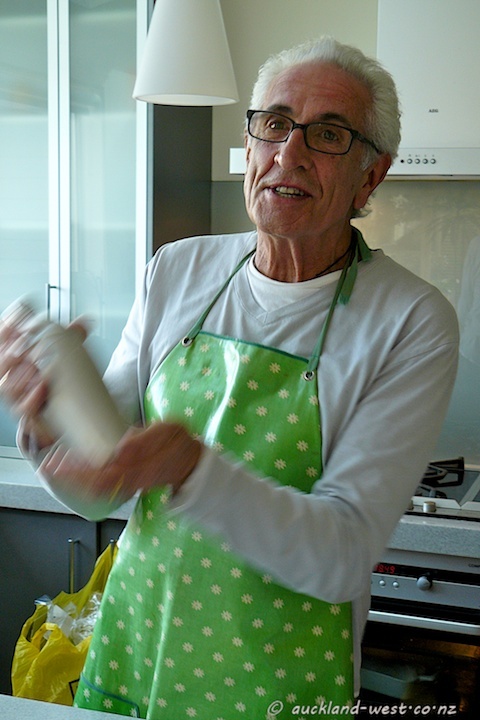 Big tensions – playfully resolved, with a mischievous glint in his eye, by John Lyall, who appeared in this blog before. 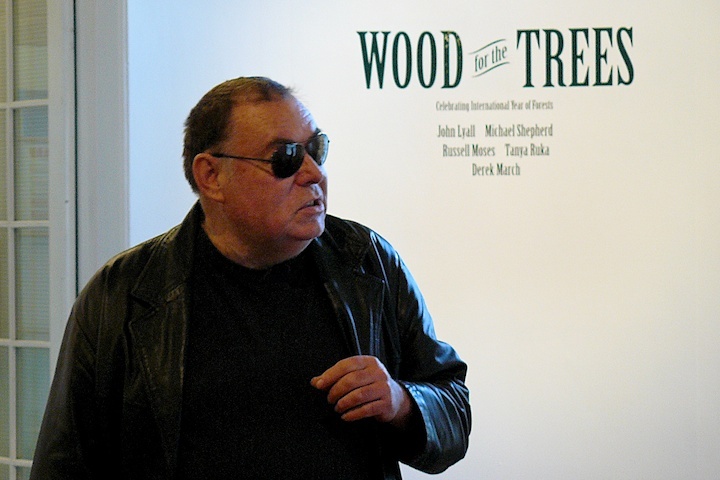 Go see the exhibition, it runs to October 9; and if the curves – or some of their representations – are not your cup of tea, you will find something amongst the other works in the show. Read about rose curves. 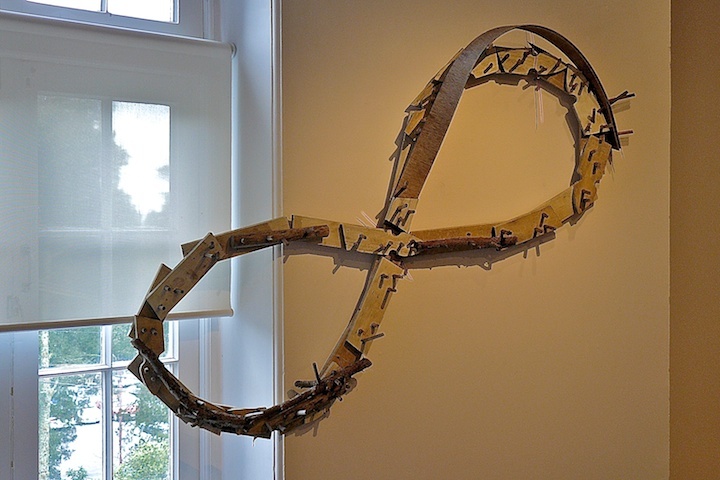 Read about the lemniscate of Bernoulli. 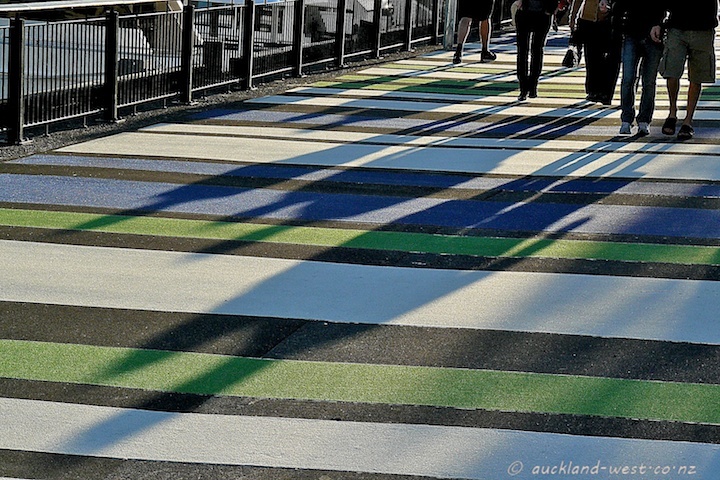 The Wynyard Quarter opened to the public on August 6, and we all love it. Eat, drink and play. 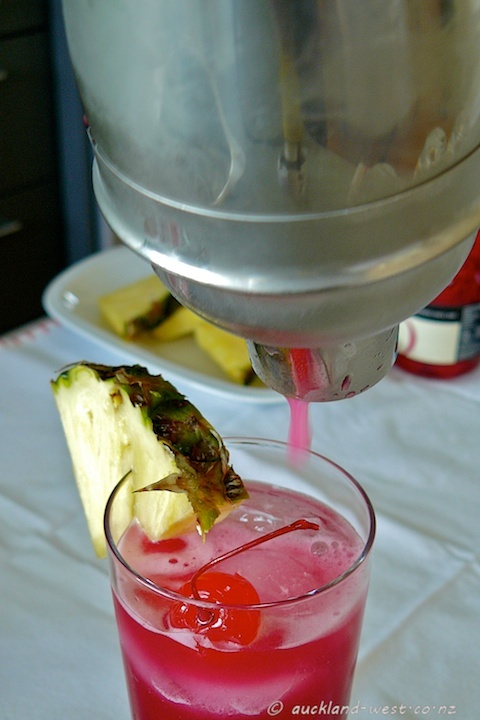 Our friend David treated us to his re-creation of Singapore Sling, having just returned from memorable days in Singapore and Malaysia. He and Ingrid indulged in this decadent colonial creation at Raffles Hotel Long Bar – in the footsteps of people like Ernest Hemingway and Somerset Maugham. 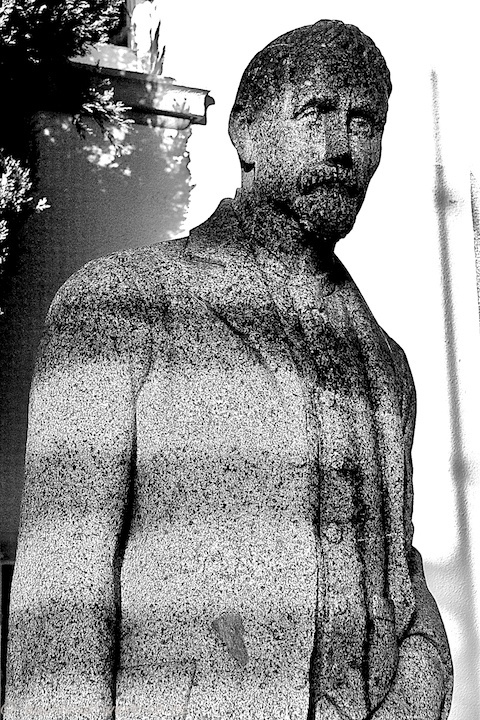 This statue of a dapper Henry Atkinson (1838-1921) stands at the corner of Lopdell House in Titirangi. In particular light, he appears to wear stripy convict garb. The reason for this is visible on this picture (taken at a different time of day and year). Henry Atkinson, a civil and water engineer, arrived in New Zealand in 1863 to supervise the construction of the Auckland Gas Works, where he was director for 35 years. In the 1870’s he became interested in Titirangi, purchasing significant blocks of land. Mount Atkinson is named after him, and this statue originally stood on top of Mount Atkinson (moved down because of vandalism). 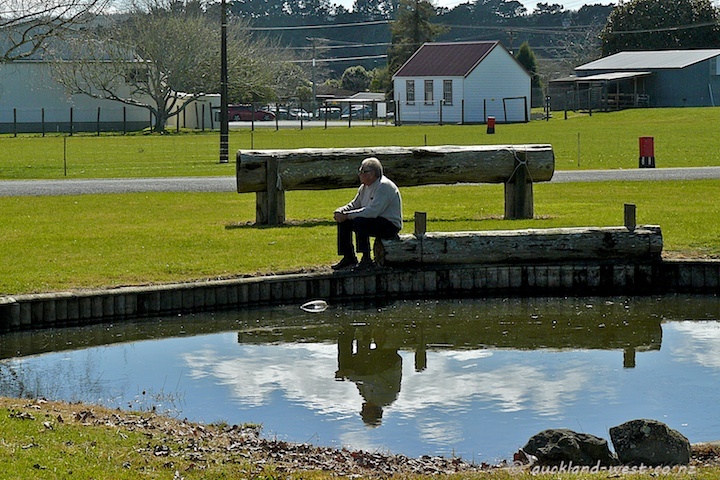 Later he gifted sizable areas of land to the city for the construction of a water supply from the Nihotupu Stream. Much more information on Henry Atkinson and the history of Titirangi may be found in the book “Titirangi – Fringe of Heaven” by Marc Bonny (West Auckland Historical Society, 2011). Behind me is the hustle and bustle of last Sunday’s Kumeu Country Market. This chap has found the ideal spot for reflection. The rear window reflects a bit of the evening sky at 6 p.m. last night as we went to an exhibition opening at Lopdell House. But mainly it serves as background to this ingenious use of a feather. 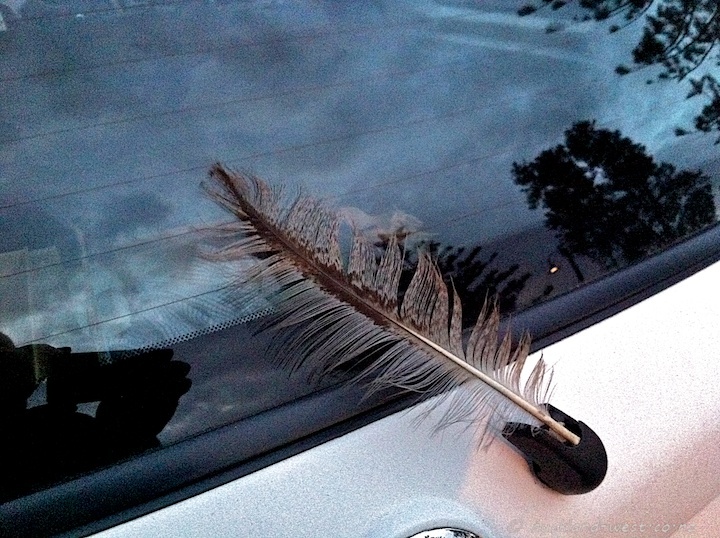 We have seen plenty of coat hanger aerials, but this is the first feather wiper that I have come across. 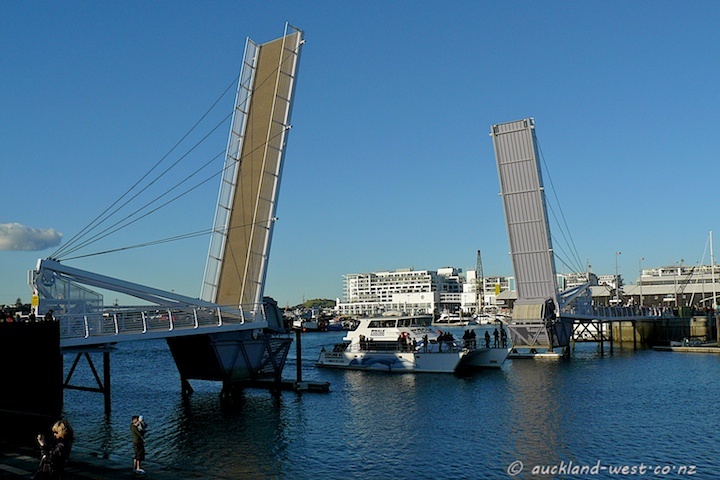 The bridge has just been lowered, the crowds on either side enter the bridge and are about to meet. 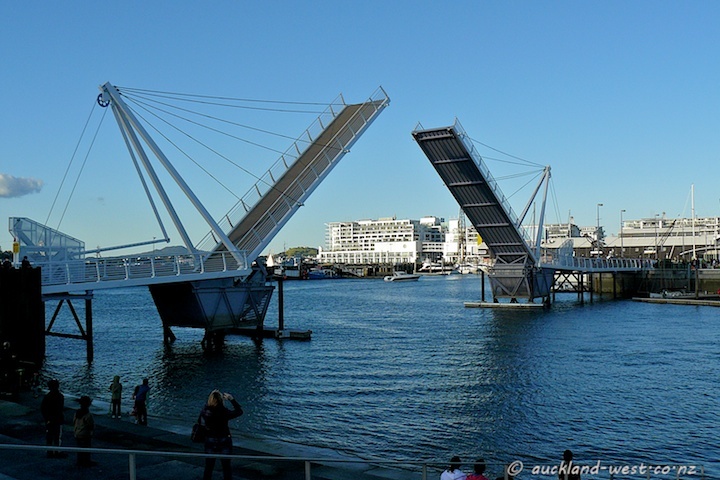 The new Te Wero bridge is a bascule bridge for pedestrian and bicycle use only. There is a longer-term project for a more substantial bridge which will also allow passenger transport. A rolling lift bridge constructed by the Cleveland Bridge and Engineering Company (Darlington, UK) and carrying road and rail traffic has been in use since the 1930s, and is still in place, albeit in a fixed position (outside picture, to the right). 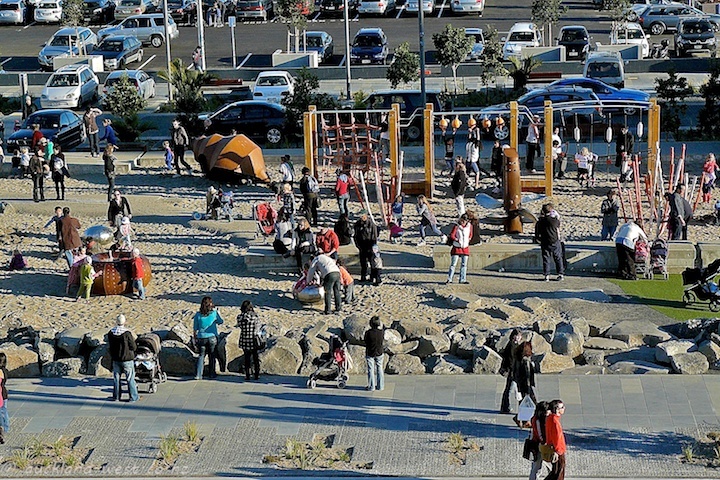 Auckland is taking possession of the newly opened (August 6) Wynyard Quarter, especially as the weekend was full of sunshine – albeit with a fresh wintery breeze. 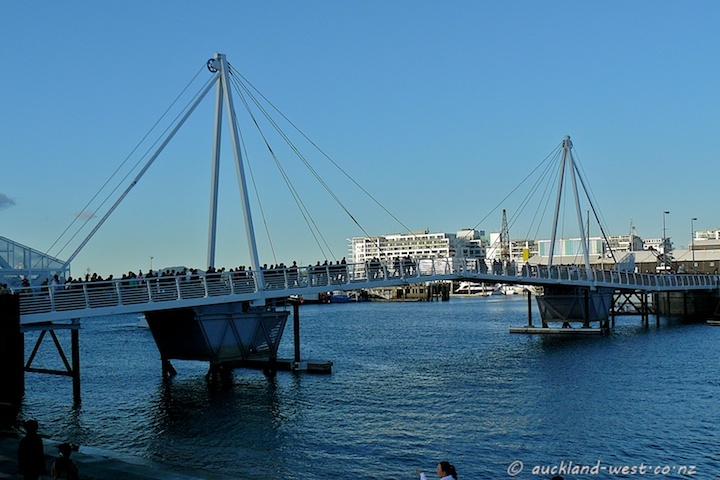 This is the colourful approach to the Te Wero Island Bridge which provides a shortcut from the Ferry Building straight through to the new Convention Centre and Cafes/Restaurants of North Wharf nearby. We will explore this area in more detail. 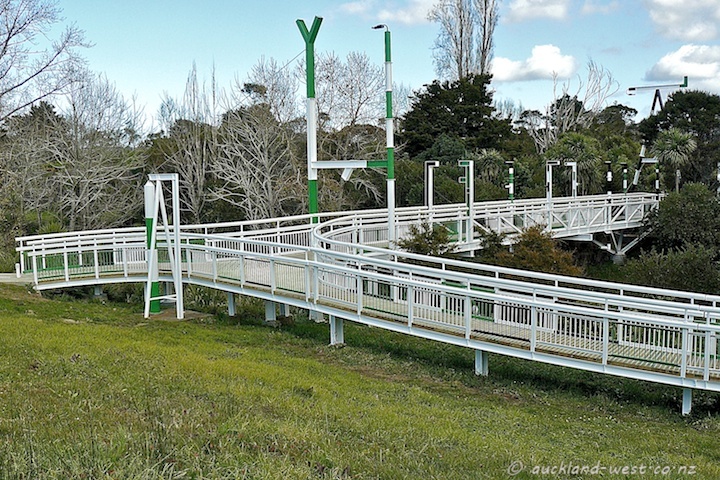 Waitakere City (now part of Auckland) has a number of “Art/Design Bridges“, one of them is the Opanuku Footbridge, connecting the grounds of the Corban Estate Arts Centre to Henderson Park at the bottom of Mount Lebanon Lane. Constructed in 2003, the design is by artist Neil Miller, invoking the fact that this once was railway land with its signal-like structures. Recently the bridge got refurbished, new planks and a new coat of paint, white colour replacing the old grey – a whole new statement in the landscape. 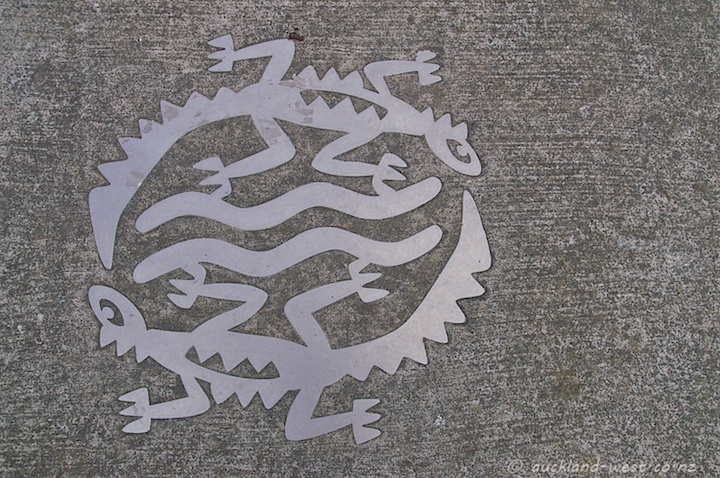 On the approach to the bridge, the logo (geckos and eels) of Project Twin Streams (a local conservation initiative) is embedded in the pavement (design by Graeme Gash, Waitakere Arts Laureate). We had travelled on Highway 99 from Vancouver and stopped in the small town of Lillooet on the Fraser River for the night (about halfway between Whistler and Kamloops, and a world apart from flash Whistler). 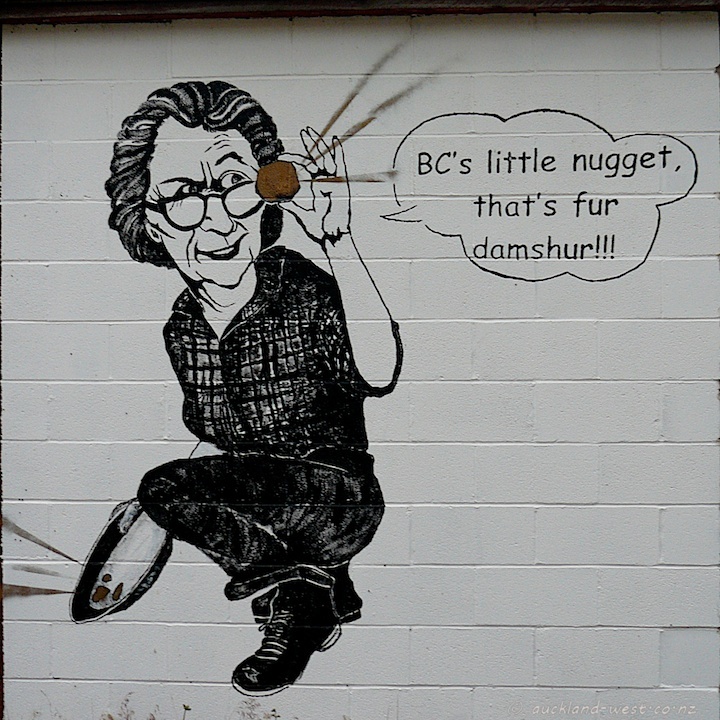 On the way to Dina’s Place for dinner, I spotted a mural and proceeded to take a picture. 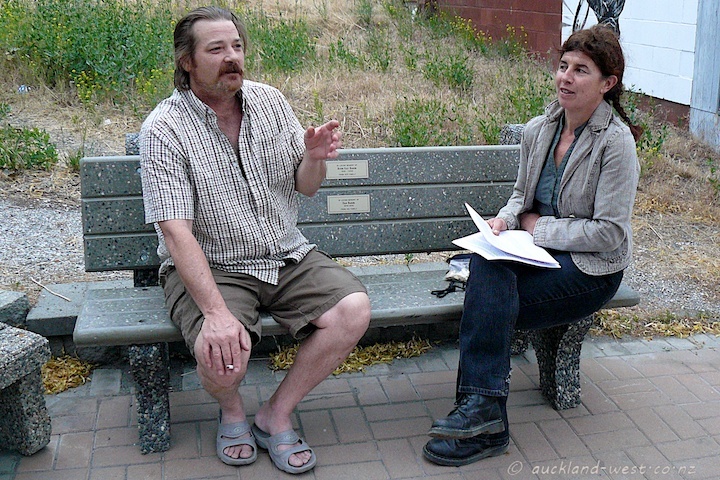 “Do you know who this is”, a voice rang out from a bench in front. And so it came that we got to know about “Ma Murray“, a local identity who co-founded (with her husband) the “Bridge River Lillooet News” in 1934. A feisty woman by all accounts, brought to life by the story-telling talents of Dan. He would probably have held all of us spell-bound for the rest of the evening, had we not been hungry (it was about 8:30 in the evening, love those long evenings!). Next day we visited his “House of Jade Mineral Museum” just a couple of steps from this bench. We heard lots more about the past of the place, which is “Mile O” of the original Cariboo Wagon Road to the lure of gold (around 1860). 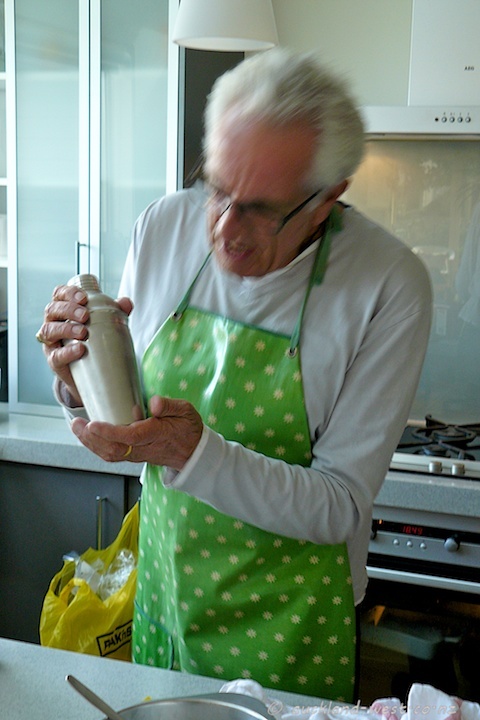 And about Jade – New Zealand greenstone was well known to him, you have to know your competition! His little shop is full of gemstones and crystals – from nearby and from afar – and a story for each.